What is One Hour Translation? One Hour Translation is a fast, professional, and affordable human translation service, available 24/7. How does the service work? You send your material for human translation by following the wizard on the service’s home page. You fill in the 1-2-3 Wizard on the homepage. Finally, you approve the quote and pay. It is that simple. You can communicate with your translator during and after the translation process. Subscribers can select the source and target language/s from the 75 languages supported. The service supports almost all file types, but if you have doubts you can contact the 24/7 support team for assistance. If you need the translation quickly, you can split the files into several projects so that several translators can work in parallel. Alternatively, you can contact the support and they will help you split a large file into several projects so that they can meet your deadline. You can select the nature of your materials, e.g. legal, technical etc. OHT has expert translators that specialize in different fields. Once started, a professional translator translates approx. 200 words an hour and about 1800 words a day. To get projects done faster, OHT can allocate more than one translator per language. MyTeam is a dedicated team of translators OHT allocates for your account. You have direct contact with your team, and they know your requirements, materials etc., thus offering consistency and quality over time. You can work directly with top-rated, experienced translators. No middlemen, no hassle, just one-on-one partnerships. OHT’s Translation API offers a direct interface to professional translation services in real-time. Scaling with your business, the API integrates seamlessly into your CMS and automatically translates as you post new material to your site, without any further investment or training. Give your users a branded portal to submit their translation projects. Let your users log into your own branded project portal, submit assignments, and communicate directly with the translators working on their projects. Allocate budget between the different departments and control their spend. With OHT’s Real Time Reviews technology, your translation projects are continuously reviewed by other native-speaking translators. The result is error-less translation. To save your time, OHT has streamlined the entire translation workflow, eliminating all delays. Your projects start within minutes, not days. 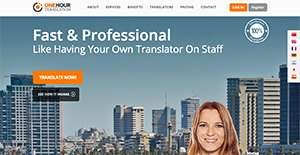 The service can split a project between several translators, working in parallel for quicker delivery. It is committed to deadlines – they add a countdown timer to your project page that shows when the translation will be delivered. OHT’s intuitive project management system simplifies complex translation processes for you, so you can focus on your business goals. What Problems Will One Hour Translation Solve? Your company is looking to expand the reach of your services/products to other countries. The most efficient way to attract new customers is to localize your website. Here is where OHT comes in. OHT offers localization services/website translation that enables your company to enter new markets and to compete effectively, defeating language and cultural barriers of your target market. It’s been proven many times: The best way to see your conversion double or triple is to offer your web site, eCommerce platform, and advertising materials in the native language of your target market. It’s simple, really; people are more apt to stay on your page and more likely to click ‘BUY’ when they’re reading the product descriptions and other material in their own language – if the text is well-written from a native speaker’s comfort point of view. Your company has large volume of material in a Content Management System (CMS) that needs to be translated in real time. OHT’s Translation API is designed for you. Scaling with your company, it integrates seamlessly into your CMS and as you post new material they are translated automatically, without any further investment or staff training necessary, with final translated files posted directly back to your CMS. Your company needs an urgent translation of a RFP into English. Translating this type of files isn’t an easy task for someone with insufficient knowledge in that field. You need an expert to handle it and you need him now. OHT understands that some documents need industry-specific knowledge and ‘jargon’ and therefore a general understanding of a language isn’t enough. To ensure both the language and industry specific terminology is correct, you need a professional translator who is also a professional in your field. All members of OHT’s Expert Translators team have a specific expertise, skills, and relevant background to handle projects that require a deep understanding of the subject matter. The expert translators are divided into four departments: Business & Legal Translation, Technical & Scientific Translation, High-Tech Translation, and Marketing Translation. If you are interested in One Hour Translation it might also be sensible to check out other subcategories of Best Translation Software collected in our database of B2B software reviews. Every company has its own characteristics, and might require a specific Translation Software solution that will be designed for their business size, type of customers and staff and even particular niche they deal with. We advise you don't count on finding an ideal software that is going to be suitable for each business regardless of their history is. It may be a good idea to read a few One Hour Translation reviews first and even then you should keep in mind what the service is supposed to do for your company and your workers. Do you need an easy and straightforward service with just basic functions? Will you actually make use of the complex functionalities required by experts and large enterprises? Are there any specific features that are especially useful for the industry you operate in? If you ask yourself these questions it will be much easier to locate a solid service that will fit your budget. How Much Does One Hour Translation Cost? We realize that when you make a decision to buy Translation Software it’s important not only to see how experts evaluate it in their reviews, but also to find out if the real people and companies that buy it are actually satisfied with the product. That’s why we’ve created our behavior-based Customer Satisfaction Algorithm™ that gathers customer reviews, comments and One Hour Translation reviews across a wide range of social media sites. The data is then presented in an easy to digest form showing how many people had positive and negative experience with One Hour Translation. With that information at hand you should be equipped to make an informed buying decision that you won’t regret. What are One Hour Translation pricing details? What integrations are available for One Hour Translation? OHT’s third party integrations enable you to automate translation workflow within your current content management system (CMS). You can send your website content for translation directly from your CMS interface, without any further investment or training on your side. The integrations list includes Drupal, WordPress, Shopify, Weebly, HubSpot, and Squarespace. Current integrations include: WPML (Wordpress), TMGMT (Drupal), and Translation Exchange. Pros: Easy way to share the desired texts and the ability to emphasize on the manner I want the text to be translated. Speed of work and delivery. Cons: Nothing I can mention at this point. Cons: Maybe the price could be lower. But it's important to keep this level of quality, so I don't argue. Easy way to share the desired texts and the ability to emphasize on the manner I want the text to be translated. Speed of work and delivery. If you need more information about One Hour Translation or you simply have a question let us know what you need and we’ll forward your request directly to the vendor.